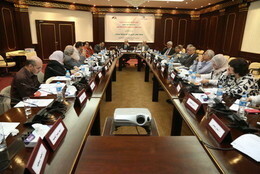 Roundtable to discuss the procedures of launching the 1st Session of the Prize on "Upbringing for Citizenship"
Under the initiative and auspices of HRH Prince Talal Bin Abdul Aziz, ACCD has held a Roundtable to discuss the procedures of launching King Abdul Aziz Prize for Scientific Researches in Childhood Issues in Arab Countries on the 20th of May 2017. The Roundtable has been attended by more than 15 experts from 4 Arab countries (Tunisia - Saudi Arabia - Lebanon - Egypt) to discuss the conceptual framework of the Prize and its regulations and sections. The Prize aims to promote and enrich scientific research in the social and educational fields, to contribute in supporting educational plans and child protection policies, seeking to activate child rights to participation, development, inclusion and protection. The experts have adopted that "Upbringing for Citizenship" will be the topic of the 1st Session of the Prize, stemming from the importance of the issue of citizenship in the current circumstances, as well as its being a strategic choice in the process of establishing a modern democratic society based on activating child rights and the principles of governance, social justice, enlightenment, rationalism and human liberation.